Birth Mom Blog: Another Baby Saved! This happened last Friday with 40 days 4 Life Dallas! Baby Saved as Children Pray! "Greetings in the name of Jesus to all! How fitting today's entry carries the images of two childlike images. 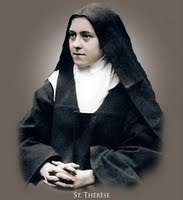 Today is the is feast day of the Guardian Angel and yesterday the feast day of St. Therese of Lisieux. Surely the Guardian Angel was watching over the unborn child as he was saved yesterday at Robinson's abortion center while the children were praying. The 6th and 8th grade students from Mount Saint Michael Catholic School had joined the others from St. Cecilia Parish to pray at the center. St. Therese had a childlike quality that endeared her to people. Her spirituality reminds us that our love for God should be as little children love their father. The baby saved is of a 21 year old unmarried woman who had been told by her own mother not to come home if she ever became pregnant out of wedlock. She didn't know what to do and felt having an abortion was the only option open to her. She did not enter Robinson's to have the abortion but stopped to talk to the sidewalk counselor who was present. As she spoke to the counselor she was handed an infant model of the baby she carries. Holding this image convinced her to turn away from having the abortion. She, with friends that had accompanied her, went to Birth Choice for further assistance. Afterwards, she came out and told the same sidewalk counselor that everything is going to be all right. Thank you Guardian Angel and St. Therese for interceding in the graces given to this young woman in order for her to have the strength of will to make the decision to save her baby." To light and guard,Rule and guide. Your prayers are saving the lives of babies and their mothers from a life of remorse and depression. Come to pray at the Robinson abortion center. If you have not committed to a time, go to the Website and sign up.